Ths is part of a significant research project on speaking in tongues called The Gift of Tongues Project which has a fourfold purpose of identifying, digitizing, translating source literature, and then finally tracing the perceptions from inception until the early 1900s. Is praying in tongues separate from speaking in tongues? Andrew Gabriel, a professor at the Pentecostal based, Horizon College and Seminary, took a look at the results of the Gift of Tongues Project. He has posited in a Facegroup discussion within the Canadian Pentecostal Research Network that the gift of tongues is separate to that of praying in tongues. This dichotomy implies that the Gift of Tongues Project, though successful in demonstrating the christian doctrine of tongues as originally understood as miraculously speaking in a foreign language, fails to address praying in tongues. Therefore Pentecostals and Charismatics are justified in continuing their modern rites without objection. 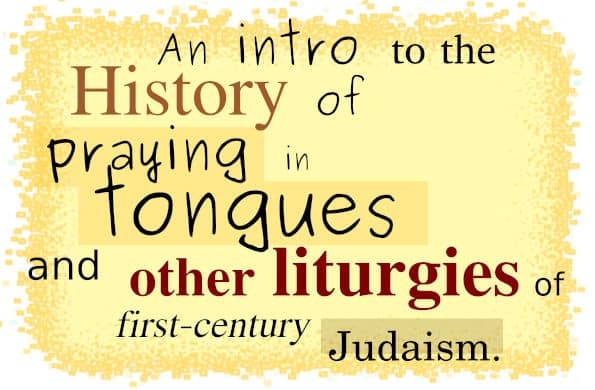 The natural response to such an assertion is this: if the synagogue liturgy is the solution for understanding speaking in tongues in the Corinthian assembly, then all the other rites, including praying in tongues are found here too. Mr. Gabriel, along with most Pentecostals, would find such a general response as unsatisfactory. Their reply is show me. This series on praying in tongues aims to fulfill this challenge. On speaking in tongues in Corinth, see the many articles in the Gift of Tongues Project under the sub-heading, the Tongues of Corinth. When one compares Paul’s list of liturgical rites with the Jewish ones of his time, they are almost identical. There is little mystery or mysticism attached to these rites. In light of this connection, the activities of Pentecost, or any supernatural phenomenon, had no relationship in Paul’s first letter to the Corinthians. However, before proceeding on demonstrating this relationship, a few notes are necessary. The data at making such a correlation is a daunting task for the researcher— mainly due to the scarceness of first-century literature on the subject. Worse yet, even less, almost none, from a Jewish Diasporan Greek perspective. Historically, the solutions were from fourth-century or later references found in the Jewish Babylonian Talmud. Unfortunately, this approach has a serious caveat. Matters of liturgy can dramatically change over 300 years. Observations of the rites within the present day church show that dramatic shifts can happen in less than forty years. Fortunately, the more recent discovery of the Dead Sea Scrolls creates a more precise window to the first-century synagogue liturgies and provides a research bridge between the Talmud and the assembly of Corinth. This bridge does not necessarily endorse the later Talmudic dictums but gives an idea of why they developed. If one discards the Dead Sea Scrolls evidence for a moment, and solely concentrate on the references found in the Jewish Babylonian Talmud, it is still better than the two more popular alternatives. The first alternative was especially espoused by German theologians in the 1800s and early 1900s and has become the defacto interpretation. They believed speaking and praying in tongues was a synergy with ancient pagan Greek practices to make Christianity a universal religion. They establish their thesis from the ancient Greek priestesses at Delphi and a later second-century Christian sect called the Montanists. This popular interpretation dominates the Greek dictionaries, encyclopedias, and commentaries. This popular theory is the doctrine of glossolalia. The glossolalia doctrine has some fundamental weaknesses. It does not take into account the Talmud, the Dead Sea Scrolls, first-century Judaism, or ecclesiastical writings to arrive at their conclusions. For more detailed information see: The Doctrine of Glossolalia series. The second alternative is from a Pentecostal and Charismatic perspective. They believe that the institutional church had suppressed the gifts for over 1800 years. They structure this conclusion from an altogether different problem. The majority of ecclesiastical writings remain in their original language untranslated, and those that do exist are not popularly available. This lack, especially English translations, had led to an erroneous conclusion that the church was silent or even repressive on the subject when it was not. The ignorance of the original texts, combined with the anti-Catholic sentiments in early Protestantism, which transformed into the subconscious realm of later Protestant movements, has allowed over 1800 years of history to be forgotten. Furthermore, a detailed study demonstrates that the Pentecostal concept of speaking/praying in tongues as a private prayer language was a later doctrine developed after the Azusa Street Revival in 1906. The creation was an antidote for the missionary tongues crisis after Azusa. People supposedly imbued with the supernatural power of speaking in foreign languages went to the foreign fields and discovered that they did not have this ability. Pentecostals solved this theological quandary by modifying the works of the German turned American historian and theologian, Philip Schaff; the Anglican writer, theologian and Dean of Canterbury, Frederick Farrar; the Anglican theologians Conybeare and Howson, and a short list of other authors and publications. These authors promoted tongues as glossolalia. Early Pentecostal leaders pentecostalized the word glossolalia, stripping away the academic language, and redefined it as a private prayer or heavenly language. Although Pentecostals hold today that spontaneous missionary tongues can still occur, the primary emphasis is on praying in tongues. No ecclesiastical history supports the Pentecostal doctrine of praying in tongues before 1908. For more detailed information see the series: Pentecostal Solutions to the Missionary Tongues and Gibberish Crisis. Both alternatives leave the reader wanting for a more thorough historical rendering. Although we are still missing features within the Jewish writings about the first-century synagogue, it remains the best approach we have on the subject. The same principles for studying the Gift of Tongues Project are applied here. The approach utilizes a historical theology framework. Historical theology has an emphasis on comparative literature. The framework looks for how a thought on a specific subject transfers from one generation to another and how it evolved. It is the best framework for understanding the christian doctrine of tongues by far. Interpreting the Corinthian rites through a first-century synagogue lens leads to many questions. We already know that the connection between Paul, Judaism, and the synagogue was strong. This was previously investigated. See the Tongues of Corinth series for more information. Pertinent questions about this relationship remain: why did Paul never use the word synagogue, συναγωγή, in his address to the Corinthians? He used the word ekklesia, ἐκκλησία, instead. If he didn’t use the word synagogue in addressing the Corinthians, then why should we assume he integrated the synagogue liturgy in the early Corinthian assembly? One commonly held argument is that the earliest form of Christianity had no relationship at all with Jewish liturgy. The break between early Christianity and Judaism was severe, and all Christian practices were innovations. Therefore, Jewish liturgy had no application in these instances. This perception requires a brief look at the contextual make-up of the first-century assemblies of Christ followers. Were they mostly Jews or Gentiles? Was Judaism a central component? What happened to the early movement and why was it removed as a child of standard Judaism? Also, another discussion revolves around the introduction of prayer into the synagogue rite. Some believed this happened after the first century, though all indications support that it happened earlier. This argument requires a further look, as it has a direct impact on understanding prayer in the Corinthian assembly. In respect to praying in tongues, we do know that later Rabbis permitted synagogue prayers performed in any language and certain ones were to remain in their original. Their discussions indicate a previous tension on the subject of whether only one, probably Hebrew or Aramaic, was allowed for prayer. Perhaps, this dilemma was still in the process of being resolved during Paul’s first-century life. Were Paul and the assembly of Corinth caught in the crosshairs of this debate? Or was this topic already settled and people were praying in so many different languages that the majority had no clue what the person uttered? Did this situation cause Paul to bring in some structure? A detailed look will be made investigating these perspectives. We also know through the Dead Sea Scrolls that prayers, hymns, and psalms were a prominent feature of Jewish worship around the first century. The Dead Sea Scrolls also have a celestial type of feeling to them. Often there are references to the combination of men and angels in their worship. Is this why Paul referred to the tongues of men and angels? Was he drawing from the spiritual fervor of the times? So the Dead Sea Scroll writings require a careful examination before drawing any conclusions. Most frequent readers to this blog will not accept such summaries as credible. They rightly want substantiation. Of course, a series of articles is in development on this topic. Stay tuned. Looking forward to the results of your research. Keep us posted! Just when you thought you had put the tongues project to bed comes this. I admire your passion and determination to follow through. I’m convinced you are uniquely qualified to pull it off so – keep the faith! I’m so thankful for your dedication and willingness to share the information it all makes complete sense now. While attending a Messianic Jewish congregation I noticed they read scriptures, sang and recited prayers in Hebrew in which some were also translated into English. I found this puzzling especially after i later discovered that all in the congregation spoke and understood English. During my readibg of the Gift of Tongues Project I was shocked because the teaching/information provided about this matter was totally opposed to my belief. Do not toss this information aside. If you are seeking to know the truth of the matter read with an open mind. Set aside all biases, look at the matter from a Judaic perspective. Compare the information to what you believe and to the whole words in the scripture THEN draw YOUR OWN conclusion. May the God of Abraham, Isaac, Jacob and father and God of Yeshua bless you abundantly. I wish the project was published in an ebook or even a small book. i would definitely love to keep in my library and to share with others.